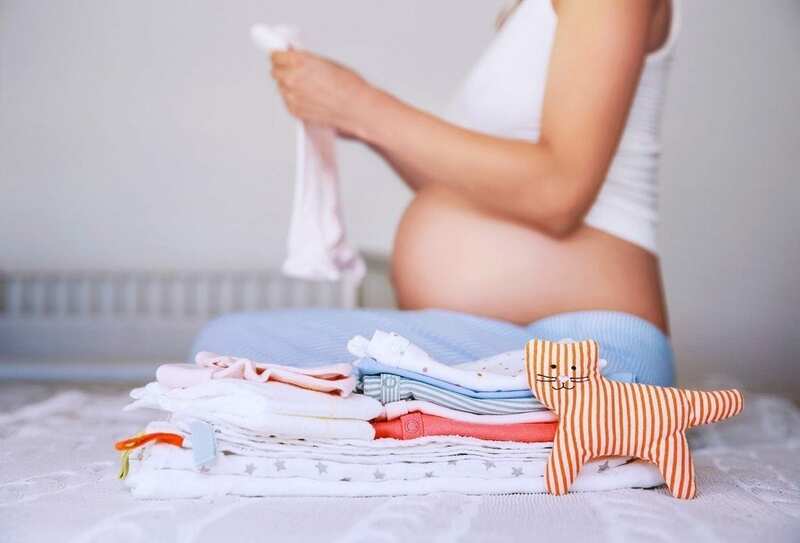 If you’re expecting a new little one, you may be stressing over all the things that you think you need to get for your baby, wondering what you really need and what you should register for. I mean, have you gone into a buybuy Baby?! The look that comes across women’s faces when they first walk in is a look of pure terror and confusion. But don’t you worry, I’ve got you covered! This is my ultimate baby registry checklist filled with my very favorite baby goods that you won’t be able to live without! This list covers everything you would need for the first three months and beyond as well as some important things you might want to consider getting for yourself postpartum. 😉 To make it easy, I’ve split everything up into different categories. We know that the lists can get long so we hope by breaking it down for you it will makes your baby registry list not so overwhelming. As a special bonus, I’ve included links to some of my favorite and most used items within almost every suggestion. My hope is that this is an extremely thorough and helpful post as you are preparing for your little baby! Here we go! There are so many great options. Here are a few that I love that look modern and have price ranges all over the board: Pottery Barn Kids, Babyletto, Land of Nod, Ubabub, and Restoration Hardware Baby & Child. When it comes to crib mattresses you want to find something that is soft yet firm, that it properly fits the dimensions of your crib and that it is good quality. Here are some great options: Safety 1st, Naturepedic, Nook Sleep Systems. When baby leaks out of their diaper it’s helpful to have some extra protection! Here’s an affordable and highly rated crib pad. I love that it is easy to wash too! You’ll want two of these. You can purchase a changing table, however, I actually recommend buying a dresser instead. A dresser can can grow with your baby in his/her room. Just be sure to mount your changing pad on the dresser. Here’s an inexpensive one and a more expensive option. We have the Keekaroo and LOVE it! Any changing pad cover will do, but I personally love the ones from Aden + Anais, Little Unicorn, and The Land of Nod. Such cute patterns! There are some beautiful rockers/gliders at Monte Design and Pottery Barn Kids, but they can get a bit expensive. This is a great one from Nursery Works that has a cool modern look. Not all babies immediately sleep in their cribs. More and more mothers are choosing bassinets, Moses baskets or co-sleepers for the first couple of months so they can remain close to their little ones. This makes it easier on nighttime feedings, too. There are many options that you can choose from–Moses basket and co-sleepers. Look too see what fits your style and budget. My favorite co-sleeper options are the DockATot, Snuggle Me, HALO Bassinest and the Fisher Price Rock ‘n Play. This brings your baby within arms reach. Swaddle Blankets (5) & Sleep Sacks (2-3). I just love these Aden + Anais swaddling cloths and recommend the HALO Sleep Sack, the Miracle Blanket, and the Summer Infant SwaddleMes for swaddling made easy. To get a nice and tight swaddle, get the flannel blankets. Again, The Land of Nod has such a lovely collection! QuickZip also has some great ones too that make it super easy for you to take on and off. You’ll definitely want to make sure that you register for a few. You need to be ready in case baby has a poop, vomit or pee accident. The crib sheets are pretty thin so they can get messy. Here are some cute ones from The Land of Nod, Pottery Barn Kids, and this cute elephant hamper that every parent wants! You don’t have to spend the extra moola to get a diaper pail for your room. But if you are wanting to keep those smells at bay, I love Ubbi and the Dekor diaper pail. You’re going to need some bottles whether you decide to breastfeed or bottle-feed. You can’t always be around your baby for every feeding so thank goodness for pumping and bottles. My all time favorite bottles are Dr. Brown’s, Tommee Tippee, Comotomo, and Mimijumi. Bottles can get pretty nasty if you don’t clean them properly. A good bottle brush can help with that. My favorite bottle brushes are Dr. Brown’s, OXO tot, and Munchkins. The soft end really allows you to get into and clean all those nooks and crannies. Honestly, those big fancy electric steam sterilizers are not necessary. They are cool if you want the convenience and have the money, but you don’t have to have them if you don’t want to. Your dishwasher can do the same thing, but if you don’t want your food residue to potentially get on your baby’s things, then go for the microwavable sterilizer. Here’s Dr. Brown’s and Avent’s. Sterlizer bags are also a great option because they are inexpensive and easy to use! If you’re wanting something a little more heavy duty, check out the Aian Sterilizer and Dryer. There are so many different types of pacifiers. I have to say, don’t just get a bunch of one brand, get one of different brands so you can see which your baby prefers. There’s Soothies, NUK, MAM, Natursutten, Wubbanub, Doddle & Co, etc. I’d have to say that my very favorite is Kiinde since you can heat up not only bottles but breastmilk storage bags too. Other options are Munchkin and Dr. Brown’s. You can read here what all of my nursing essentials are and find out my favorite pumps. Don’t forget to the get the parts since the pump sometimes doesn’t come with them as well as the storage bags. The Covered Goods nursing cover is my favorite since it’s super lightweight and breathable, and makes it easy to view baby while keeping mama completely covered. My favorite nursing pillows are the Boppy and My Breast Friend. The Stokke Tripp Trapp chair is amazing! It’s a little pricey though so if you want some other options, you can see our list of best high chairs here. You’ll needs lots of diapers, but make sure that you don’t get too many of one size. Get some newborn, then a bit more of size 1 and 2. Some organic options that you can try are Honest, Seventh Generation and Babyganics, but if “organic” is not a priority, you can get Pampers or Huggies. It’s so nice and convenient to be able to have your baby’s diaper changing essentials wherever you need them in the house. A diaper caddy does just that! The one that’s my favorite is from Ubbi. Love it! A ton of my friends and clients have the Puj Infant Tub. I like to warn families that it mainly fits in small sinks or pedestal sinks so check into this before registering. Other infant tubs that I recommend are Blooming Bath, and 4moms tub. For shampoo, body wash and lotions, I recommend Honest, Burt’s Bees, and Mustela. Love Aden + Anais washcloths. Great towels and so soft!! Skip Hop, Boon, and Puj have popular faucet covers and you have to save your knees when you’re bathing your babe. OXO, Skip Hop, Puj, and Aquatopia have some great ones! I can’t tell you how many times I’ve come to see new parents as their postpartum doula and they accidentally clipped the end of their baby’s finger when clipping their nails. YIKES! This is why I recommend a baby nail scissors or the Zoli nail file to have more control while trimming baby’s nails. Save those baby fingers! You’ll also need a baby nail file to dull the edges. These are big investments, but are pieces that will stay with your family for years. You want to make sure that you choose wisely so I recommend looking at these products in person and trying them out before adding them to your list. Here is a great list of strollers for the urban mom and the suburban mom. Some top car seats that I recommend are the Chicco KeyFit 30, Nuna Pipa, UppaBaby MESA, among others. Some of the bouncers and loungers that I like are BabyBjörn, Stokke, Nuna Leaf and Fisher Price. Popular swings are 4Moms Rockaroo and Fisher Price. A travel crib isn’t just for big trips. If you plan on taking the baby to the grandparents for the night or even being in someone else’s house during nap time, it’s good to have a comfortable and familiar spot for baby to sleep. My favorite is the 4Moms Breeze Playard. It’s a bit of a splurge, but your little one can use it for awhile. If you have a sleeping baby, but need to check your little one’s temperature, no one wants to wake him/her up and have to put him/her right back to bed. Get one that can read the temperature by just swiping over their forehead. We love Crane humidifiers. They are extremely well made and are perfect for your child’s room. You can see the cute one that we posted about here. Majority of parents are steering away from audio only monitors and are going to video monitors. I like Motorola, Infant Optics and Babysense monitors. It’s great to be able to actually see baby while he/she sleeps. It adds an extra bit of comfort. And for more peace of mind, Owlet is a great registry item! Babies are used to hearing a lot of noise when they are in utero so it’s comforting when they hear white noise. It helps them go to sleep. The ones that I recommend are from Dohm and the Sleep Shusher. This thing is amazing. It’s a must-have when having a baby! Their Windi is pretty spectacular too. 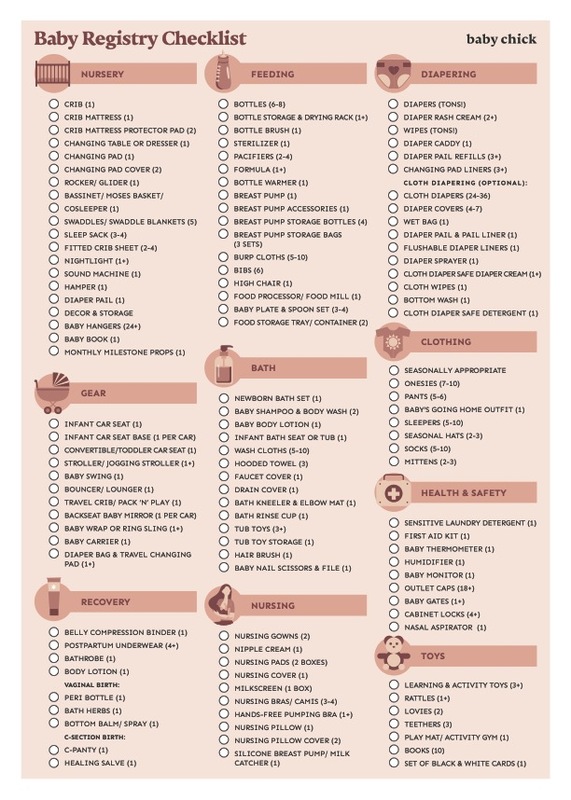 I’ve added my list of must-have postpartum essentials to this checklist, (which you can read more about here on my postpartum must-haves) because a lot of moms get everything that they need for baby but they forget about themselves. Make sure to stock up on the things that you’ll need too! There it is! My ULTIMATE Baby Registry Checklist. Let us know if we’re missing anything or if there is anything that we should add!